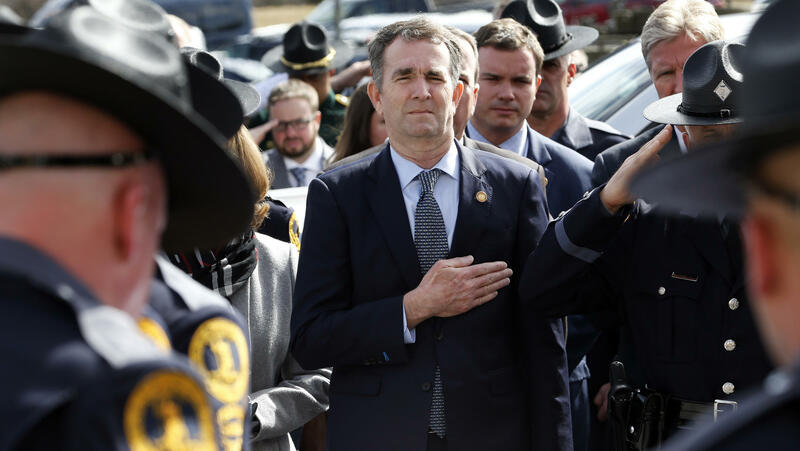 Virginia Gov. Ralph Northam places hand over his heart at a funeral for a state trooper Saturday in Chilhowie, Va., during one of his first public appearances since the blackface scandal broke. 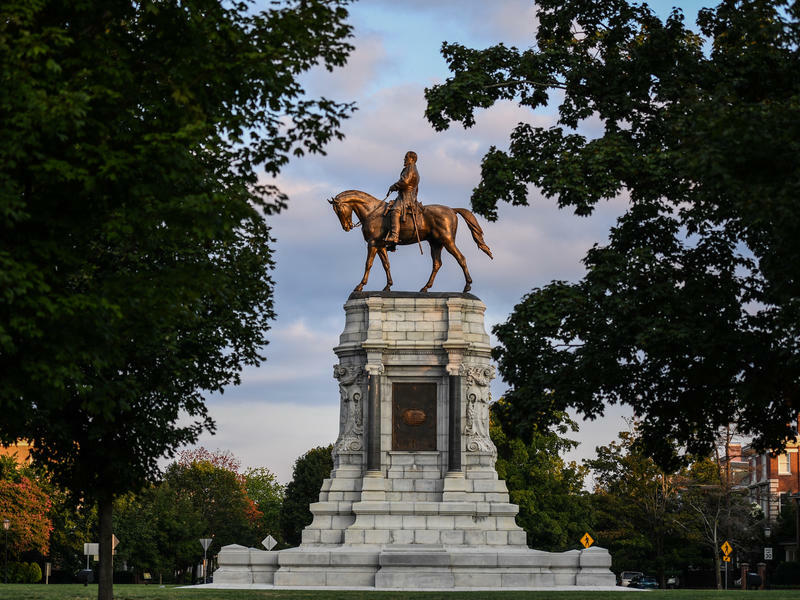 It may be tough to believe it's been just a week and a half since a racist photograph in a decades-old medical school yearbook knocked Virginia's leadership into disarray. Consider: In just 10 days, Gov. Ralph Northam has admitted to being in to being in the racist photo — then denied it, then admitted to wearing blackface on a separate occasion. Attorney General Mark Herring said he, too, had donned blackface. And two sexual assault allegations have surfaced against Lt. Gov. Justin Fairfax. But amid all this turmoil, there is at least one thing that has not happened: Not one of the three men has bowed to public pressure and resigned. Virginia "needs someone who is strong who has empathy, who has courage and who has a moral compass," Northam told CBS News on Sunday, in his first televised interview since the scandal broke. "And that's why I'm not going anywhere. I have learned from this. I have a lot more to learn." Northam's assertion defies the condemnations issued recently by prominent Virginian politicians on both sides of the aisle — many of whom have also called on Fairfax, who is black, to step down for very different reasons. Since a second woman came forward Friday with a sexual assault claim against him, the lieutenant governor has been asked to resign by the Democratic Party of Virginia, Sen. Tim Kaine and nearly the state's entire Democratic congressional delegation, among others. But Fairfax has steadfastly maintained that the two incidents that surfaced this week — one from 2004, and the other from 2000 — were consensual sexual encounters, and he has asked for the FBI to conduct an investigation in order to ensure "due process." 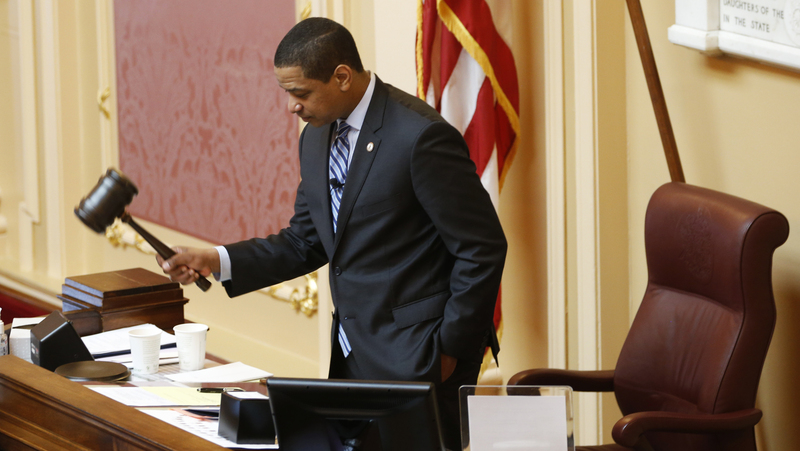 Despite the controversy this week, Justin Fairfax continued to fulfill his duties as lieutenant governor — such as presiding over Senate sessions at the Capitol. Here he is gavelling a session to order Friday in Richmond. Those rebuttals have not satisfied fellow Democrat Patrick Hope, a state delegate who has promised to introduce articles of impeachment when lawmakers reconvene Monday. Both of Fairfax's accusers, Vanessa Tyson and Meredith Watson, announced over the weekend that they would be willing to testify at an impeachment hearing if called upon. As embattled as the politicians may seem at the moment, it's possible that today's unique political environment will help the three men hang onto office. Alison Dagnes, a political science professor at Shippensburg University of Pennsylvania, says they've got the benefit of deep political polarization, the growth of partisan media — and now the model of President Trump, who has often survived his scandals simply by riding out the news cycle. "That has served as an unfortunate lesson now for politicians who are in office. And this is regardless of party because Northam, of course, is a Democrat," says Dagnes, who has studied and written extensively about political scandals. And according to Dagnes, the increasingly tumultuous news cycle may help politicians endure scandal until the public loses interest — but it doesn't help resolve the painful questions those scandals have raised. "When politicians are given the cue that if they just keep their mouth closed and they disappear for a little while, it'll all go away, they're wrong. They may keep their job, but at what cost?" she says. "Because the country will still be hurt by this until we address it." Gregory Howard, interim dean of theology at Richmond's historically black Virginia Union University, says there's still another point not to miss when thinking about the apologies offered by Northam and Herring. "Every now and again, we slip up, we fall, and we have a responsibility to dust ourselves off and seek for full healing and reconciliation — but reconciliation that is based upon the one who has been offended, not the offender," Howard explains. For now, it appears Virginians themselves remain split on whether their leaders must step down. In a poll conducted late last week by The Washington Post and the Schar School of Policy and Government at George Mason University, respondents were evenly divided as to whether Northam should resign. And most of them did not know enough about Fairfax's response to the allegations to feel strongly about it. To Howard and many of his students, though, the answer is clear. "This is not a partisan issue. This is not a political issue," he says. "This is a matter of humanity and morality." Political enemies and allies alike are calling for Virginia Gov. Ralph Northam, a Democrat, to step down after a racist photo from his 1984 medical school yearbook was uncovered. But Northam has shown no inclination to do so. Now the two Democratic officials in line behind him to assume the governorship are both embroiled in scandals of their own.